Convolvulus is a genus of annual and perennial shrubs from tropical and Mediterranean regions. These easy to grow plants vary from climbers or trailing plants to shrubs and mound forming bushes. Plants and flowers also vary in size and spread. Flowers of Convolvulus plants are trumpet shaped and vary from white and pink to purple and mauve in color. These sun loving plants grow quite easily and survive very well in sandy, chalky and dry soil. Convolvulus Cneorum which is commonly known as Silver Bush grows as low growing plant and usually forms a think carpet of evergreen foliage. 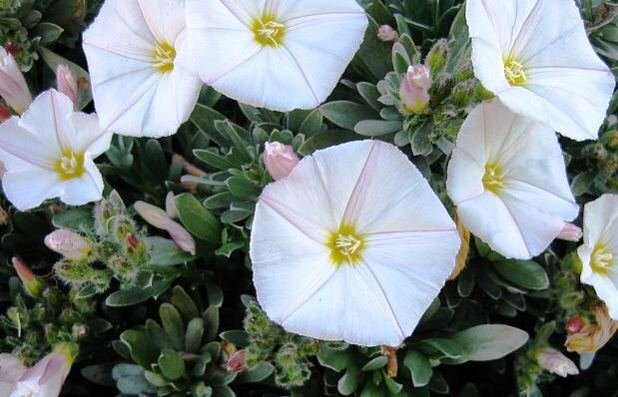 Because of its capacity to withstand drought and grow in poor soil, Convolvulus Cneorum is a good choice for rock gardens or as ground cover for sandy or poor soil. It is easy to maintain and should be pruned back after flowering. Convolvulus Cneorum or Silver Bush grows well in sunny positions where it is protected from frost and long, dry spells of cold. These plants are easily propagated from seeds and require just sufficient water; do not over water. Convolvulus Cneorum is generally related to the family of Morning Glory. Other popular species include: Convolvulus Mauritanicus, Convolvulus Tricolor and Convolvulus Arvensis.